Depending on circumstances, many boating accidents are determined by what is known as maritime law. Under maritime law, there are certain available claims that are not available with motor vehicle accidents. If a claim is truly a maritime law claim, the theory of comparative negligence may apply which can be very helpful to a Plaintiff. Thus, under maritime law, contributory negligence may not be a complete defense to a claim. Obviously, the operator of a boat is held to a reasonable person standard in the way he or she operates a boat. Often, an expert in boat operation and maneuvers may be required to prove negligence since this is an area where everyday life experience may not allow a lay person to totally understand the nuances of operating a boat. There are many types of watercraft today that could be involved in one of these types of accidents. Maryland has many bodies of water where people enjoy the use of watercrafts for skiing, tubing, cruising and other types of water activities. These types of accidents can happen when operators are following another watercraft too closely, are careless when swimmers are in the water, drive the watercraft at excessive speeds for conditions existing, are not paying attention to where they are going or when alcohol is involved with the operator of the watercraft. Because people are rarely secured with a safety restraint when traveling on a watercraft, a serious impact with a wave, another watercraft, sandbar or a permanent structure can easily cause someone to fall inside the watercraft or in certain circumstances be ejected from the watercraft. 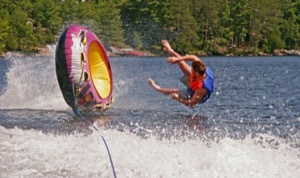 Serious injuries can occur with these types of accidents on the water. Operators of watercraft should take a water safety course and also keep familiar with the bodies of water they plan on using. There are many sandbars throughout the tributaries of the Chesapeake Bay which could easily cause an accident if the operator of a motor vehicle is not paying attention and runs into the sandbar traveling at a high rate of speed. Cases involving maritime law often have different deadlines and have a different court which must be used to file the lawsuit for the negligence action. You want to make sure that your attorney is familiar with all the deadlines and proper procedures before you choose a lawyer to represent you. Call one of our lawyers to help you with your case.